Over the holidays, you may spend a lot of time at home — and may even host guests in your home. Christmas is a great time to make your home more inviting, whether you have plans for overnight guests and big family gatherings, or you just want to feel a little more comfortable in your home on Christmas morning. And while your holiday to do list is probably a mile long, there’s still time to add a few quick updates to your home. These projects can be completed quickly — some within minutes — and pack a big punch for updating your living space. Tackle one or more of these projects to improve your home, just in time for Christmas. Refresh kitchen cabinets: You’ll be spending a lot of time in your kitchen over the holidays, so make it look good. Repaint your cabinet doors for a fresh look. Consider adding new hardware as well — or just replace the hardware for a quick update if you don’t have time to sand down, repaint, and reassemble your cabinet doors. Frame your bathroom mirror: Many builders simply stick mirrors to the wall and call it a day. You can add interest and beauty to your bathroom walls by simply putting a frame around your mirror. Add new storage: With added hooks and shelving, your guests will find it easier to make themselves at home. Install extra hooks in your bathroom, put in new shelving, and add towel racks. Put on a jacket: Not for yourself, but for your water heater. You can save energy by adding an insulating jacket to your hot water heater. This will keep water warm in the heater and reduce the need for the heater to run on standby. Add framed mirrors to closet doors: Take doors from boring and blah to inviting with inexpensive mirrors. Simply hang them on a closet door or inside a guest room door for a new look. This is great for visiting guests, as it will give them a mirror option that’s not in a high traffic bathroom. Add lighting to your kitchen: Light can make a huge difference in your kitchen, especially if your kitchen could be a little brighter. Add under cabinet lighting for a great new look and a better view while you’re working on kitchen tasks. Or, update lighting fixtures in your kitchen. Corral your cords: Whether you have cords from Christmas lights or just your flat screen TV, you can improve the look of your home in minutes by using a cord cover. This tool will organize your cords together and hide them so that you don’t have unsightly cords cluttering up your walls or floor. Add landscape lighting: As you’re installing Christmas lights, add some year round lighting updates as well. Light your paths, sidewalks, and driveway, and consider adding uplighting for the front of your home as well. It will make your home more attractive and secure. Clean your gutters: Another home improvement task that’s convenient to tackle while you’re hanging Christmas lights, simply clean out your gutters while you’re up on a ladder already. You’ll avoid clogged gutters and ice dams on your roof. Update your light bulbs: If you’re still using incandescent light bulbs in your home, it’s time to make a change. Switch to LED or compact fluorescent bulbs for more energy efficient lighting. Bonus: this is a project that only requires making a purchase for right now. Simply buy the bulbs, and when your old ones burn out, replace them with the energy efficient bulbs. Plant a tree: Planting a tree is a quick afternoon project that will pay off for years. Whether you plant a flowering tree, fruit tree, or a good, old fashioned shade tree, you’ll improve the environment right from your yard and be able to enjoy looking at (and even climbing on) the tree as long as you live in the home. With strategic planting, you can even reduce your energy bills as you enjoy shade from the tree. Get new bathroom fixtures: A new sink faucet can install in just minutes, and instantly transforms the look of your sink. Have a gross shower head or tub faucet? Just put in new fixtures and your bathroom will be more inviting. This is a great alternative to ripping out the counter top or replacing tile — and much faster and easier to do. Paint or replace your front door: Make your front porch more inviting with a new look for your front door. Give it a fresh coat of paint, or replace it altogether. Either way, you’ll improve your curb appeal. Remember to add a decorative wreath to really set it off. Start a compost bin: Designate a corner of your backyard or build a bin out of plywood, 2x4s, or even pallets, then add food, leaves, and other compostable materials to it. You’ll create an excellent natural fertilizer and reduce your trash load at the same time. Paint windows on your garage door: With a little black paint, you can make it look like your garage door has attractive windows on the top row. You can even add carriage hardware for a really upgraded look. Update your thermostat: If you’ve got a builder grade thermostat, it probably does its job just fine. But you could have a smart programmable thermostat like the Nest. With this type of thermostat, you’ll be able to teach your home how to stay at the right temperature for your usual habits, and even adjust your home’s temperature using your cell phone. Plus, it’s a great looking conversation piece that installs in about 15 minutes. Pressure wash your siding: Clean the grime and mold off of your home with a pressure washer. You can even use it to clean your gutters and second floor windows. Put a frame around your TV: Have a flat screen TV mounted on your wall? Put a frame around it to make it look a little more attractive. You can even up the art piece effect by using your TV as a slide show for photos when you’re not watching anything else. Update light fixtures: Give your dining room a new look with an updated chandelier, or make your front door more inviting with a new porch light. Updating old, outdated light fixtures can have a big impact on the look of your home. Add a peel and stick back splash: Want new counter tops, but not before Christmas? Settle for a quick new backs plash with peel and stick tiles that install in minutes. Repaint hardware: Vents, light fixtures, faucets, and other metal pieces in your home can all be painted. Simply pull them off, spray paint them outside, and put them back after they’re dry. This is a great way to fake new fixtures. Add fan blade covers: Your ceiling fans are probably among the least exciting parts of your home, but it doesn’t have to be that way. Inexpensive blade covers can be added within moments that transform the look of your ceiling fan. Close up drafts: Winter is an excellent time to identify and plug leaks in your home. 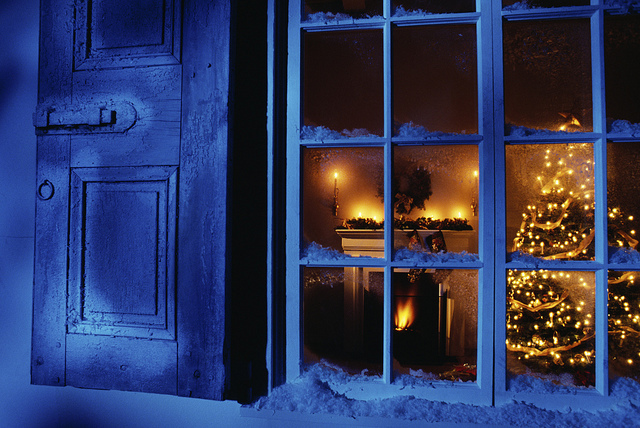 A drafty window or door can steal heat from your home and drive up energy bills. Caulk around windows and doors, install weatherstripping, and tighten hardware to make your home warmer and more energy efficient. Slap on a coat of paint: Nothing transforms a room faster, easier, and cheaper than paint. Go bold with a new color, or even just quickly paint an accent wall or even your ceiling for a new look with a pop of color. Change your air filters: If you’re not on a regular schedule for changing your air filters, start now. Up to date air filters can keep your home cleaner and remove pollutants from your indoor air, making your family and visitors healthier in your home. Clean out your dryer duct: Nothing stops Christmas fun light a house fire. Reduce your risk of fire and improve the efficiency of your dryer with a quick vacuum of your ducts. Update kitchen appliances: While not as inexpensive as many of the other quick Christmas home improvements on this list, new kitchen appliances can be installed in less than a day and make a huge impact. Plus, you’ll have a great time putting all of your new appliances to work over the holidays. Upgrade light switch covers: Buy new light switch covers at the hardware store, or just add an inexpensive painted frame to upgrade the look of your covers.